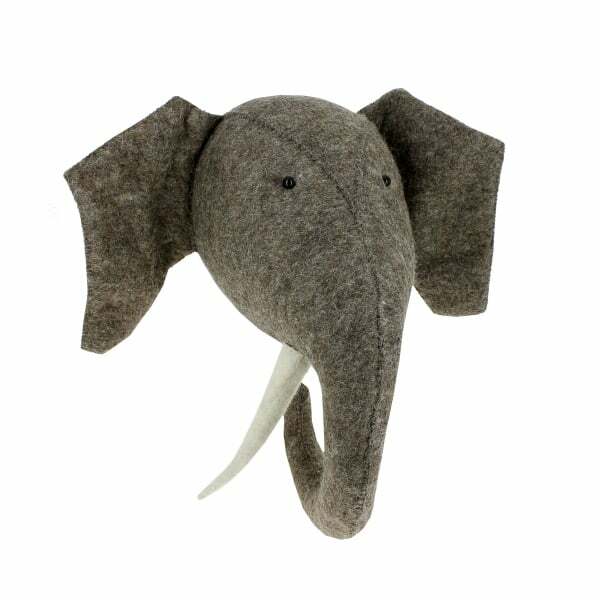 This Large Elephant Felt Animal Head by Fiona Walker England is guaranteed to make people smile. A beautiful wall mounted animal head, it will be admired by adults and children alike. The soft, plush animal head is an impressive decorative piece and will make a fun and modern statement on any wall. *** Although the elephant comes in a medium size as well as large and mini, I’d recommend getting the the same size if you are combining them on a wall*** We absolutely love these felt heads for our jungle/safari theme nursery. They are large but three of the large heads (we combined elephant, zebra and tiger in a staggered horizontal arrangement) as the only feature on a 2 metre wall, doesn’t look too big at all. Lovely quality, light but with strong fixings, I hope our little girl likes these as much as we do!